There is something so romantic about the look of a Bleeding Heart plant. After all, what is more romantic that the heart shaped flowers of this amazing plant? If you love growing perennials, this plant is a must have for your shady garden spot. 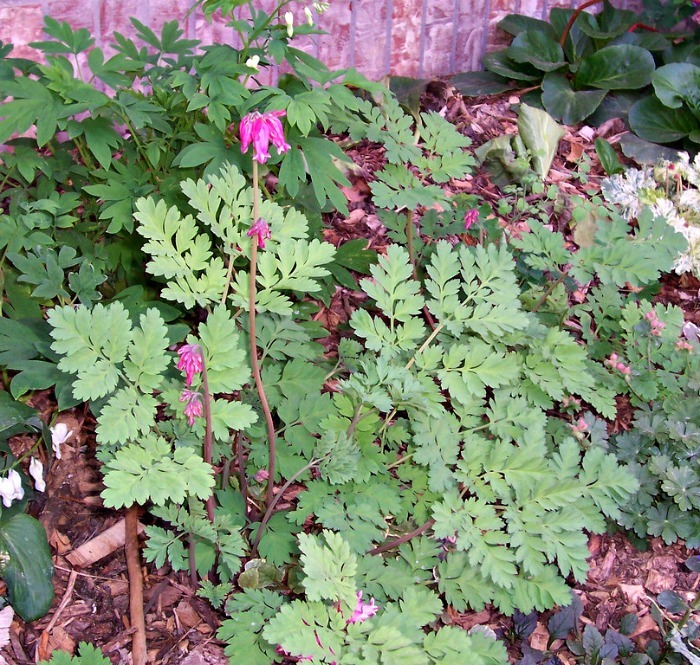 Dicentra Spectabilis is a clear favorite among American gardeners. 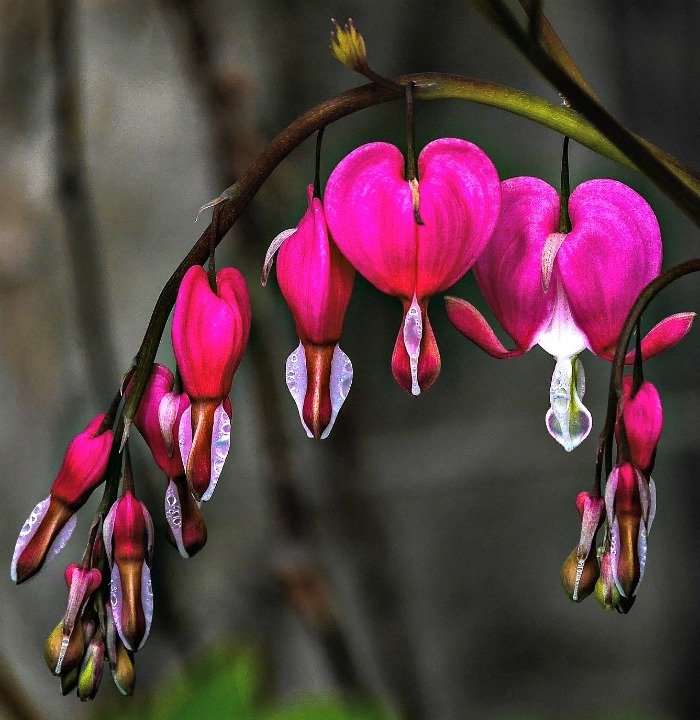 It is native to the far east and is the most commonly grown Bleeding heart plant. 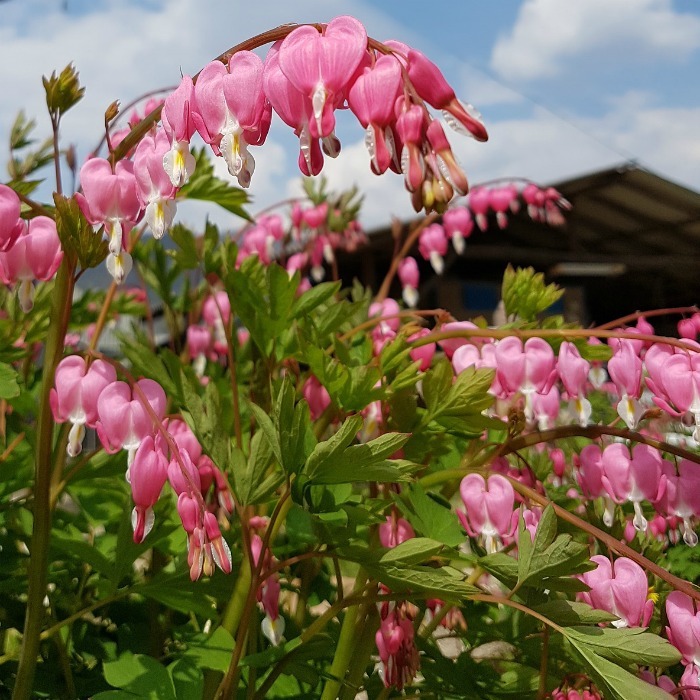 All over North America, you will find this spring beauty with its graceful arching stems and famous heart shaped flowers. If you choose the right spot and take care in watering, you will enjoy this lovely plant for year. The plant is also known as “lady of the bath” in the UK. There is also another variety, called the Fernleaf Bleeding Heart, which is a hybrid of North American wildflowers. The plant is much smaller (about 15 inches) and the flowers more bunched at the top of the stems. They will also bloom right through until fall. The plant in the foreground of the photo above is a fernleaf bleeding heart. The one behind it is the traditional old fashioned bleeding heart variety. Bleeding hearts like a spot with just dappled sunlight. My bleeding hearts and I have had a love/hate relationship for years. I have tried, unsuccessfully, to grow the perennial in spots that get some direct sunlight. I tried it in the shade of a bird bath. I tried it in an east facing spot under a pin oak that got afternoon sun. Both plants died. Full sun here in NC is out of the question for me. I now have a plant in a north facing location that gets NO direct sunlight, and it is happy as can be and flowering well. Finally! The farther north you live, the more sunlight the plant can take. Dicentra Spectabilis likes an evenly moist soil but does not like wet feet. Choose well draining soil for best results. If the plant gets too wet, yellow leaves and fungus can develop. Limp leaves that are fading in color are a sign that the plant is too dry. I only have to add extra water if the temperatures are close to 100 for many days in a row. Remember that my plant grows in a shady garden so if yours gets more sunlight, it will need more watering. 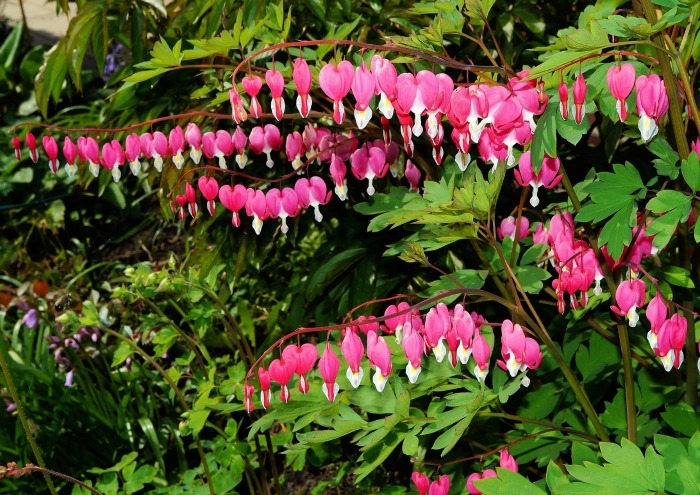 Mature bleeding heart plants can grow to 36″ tall and about 30″ wide. My plant is about 9 months old and is 18″ tall and wide already. When planting be sure to give plenty of room for it to spread out. It takes 2-5 years for a plant to reach its mature size. When the plant is fully grown, you will be delighted with the flower show! 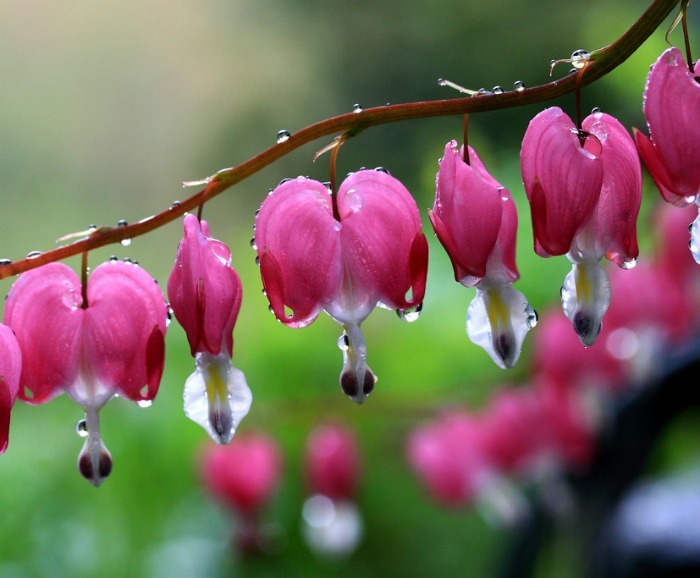 Bleeding heart plants form a pretty heart shaped flower that “bleeds” with drips on the bottom of the heart. The blossoms arrive in late winter or early spring and last about 6 weeks or more. Dicentra Spectrabilis will go dormant in summer. The Fernleaf Bleeding heart continues to bloom through fall. The flowers come in pure white, white with red stripes and various shades of pink and red. A single application of timed release fertilizer in early spring is all the plant needs to continue flowering. Organic matter in the soil is also helpful. 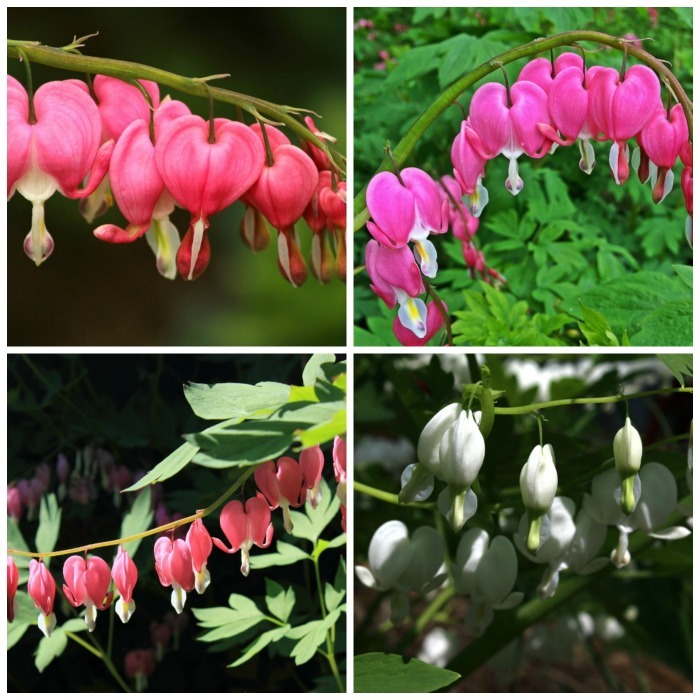 Bleeding heart usually blooms about the same time as helleborus, primroses and other early spring bloomers. The flowers are borne on long branches. The weight of the flower heads make the branches arch for a spectacular effect. 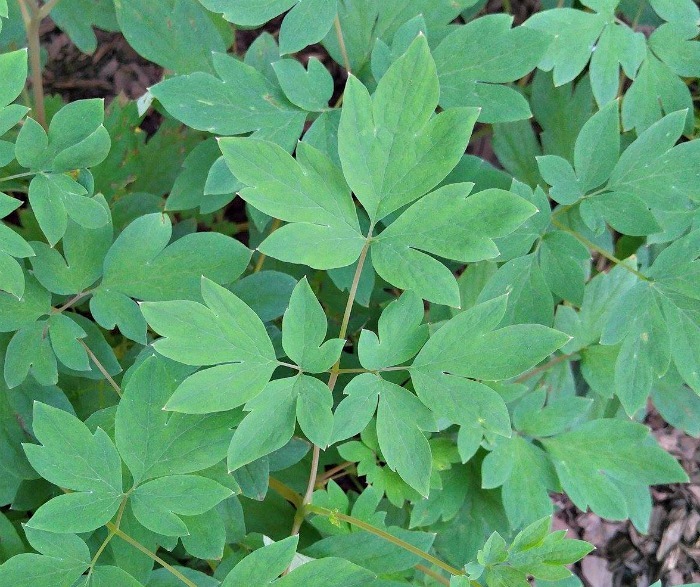 During spring and early summer, the leaves of a bleeding heart plant are green and delicate. But as the heat of the summer has an impact on the plant, you will find that they start to yellow. This is natural and signals that the end of the growing season. If your plant is showing yellow leaves earlier in the growing season, check your watering. Too much water can cause the leaves to fade and yellow. Once the leaves have really died off in late summer, you can cut it down close to the ground. Don’t do this too early, though, since the yellowing\leaves are adding nourishment for next year’s plant. Since Bleeding Heart goes dormant in mid summer, this can leave a hole in your garden. 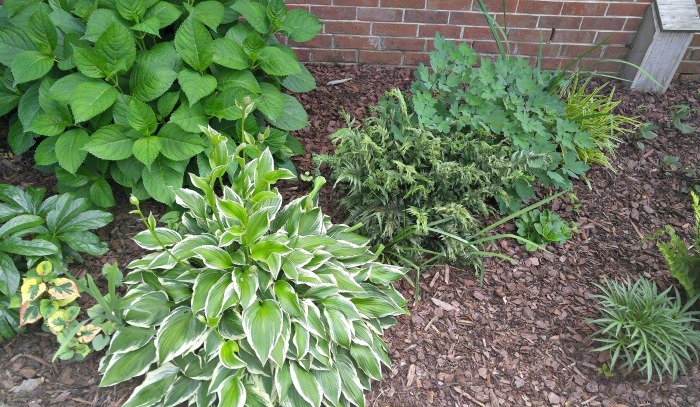 Mixing in other shade loving foliage plants that will stay green all summer long is the answer. I have hostas and ferns planted near mine and they take off when my bleeding heart is going dormant. Coral bells and astilbe are also great companion plants for bleeding heart. 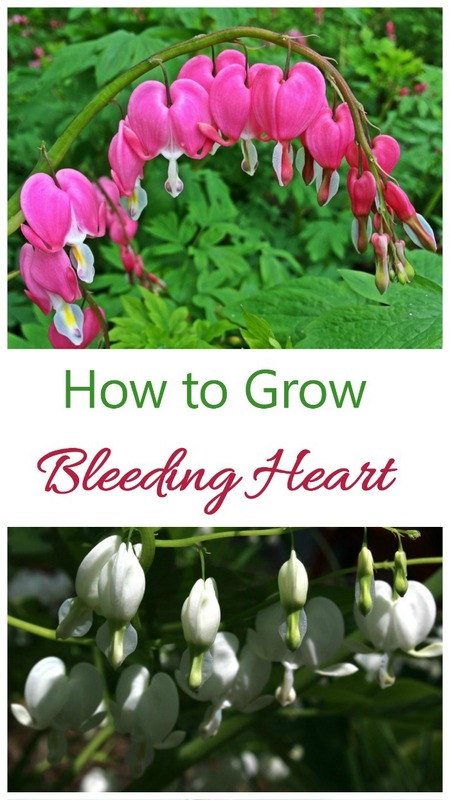 Bleeding heart will set seeds with which you can grow more plants and will also self seed. However, the most common form of propagation is division of the clumps every few years. Just carefully dig up the plant, discard and dried up roots and divide the rest of the plant for other shady areas of your garden. Spring is the best time for division. 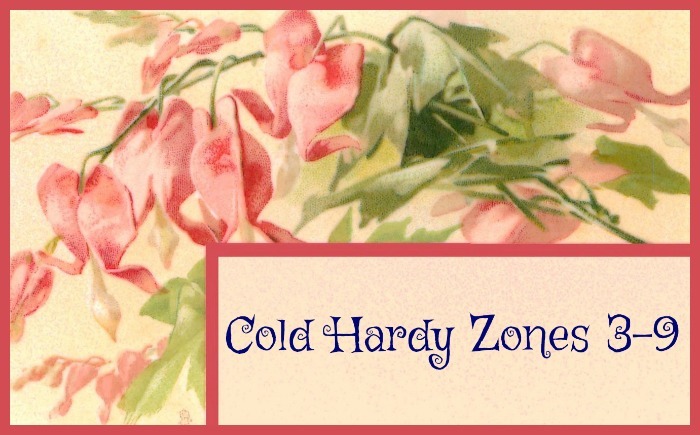 Bleeding heart plants are cold hardy in zones 3 through 9. Cooler zones will have a longer growing season in the summer, since the plant does not like the extremes that some of the hotter zones offer. One of the nice things about bleeding heart is that is deer resistant. The plant attracts butterflies and is great in containers, as long as you place it in a shady spot. Most insects leave bleeding heart alone, but aphids seem to like it. Use forceful sprays of water to dislodge and remove the bugs from effective plants. In extreme cases, you can use a horticultural soap to combat aphids.Slugs and snails also have an appetite for the new leaves of bleeding heart. Plant bleeding heart in a shady spot that gets dappled sunlight. Keep the plant evenly moist and a light application of fertilizer in early spring and you will enjoy Dicentra Spectrabilis for years to come. If you pin this image to Pinterest, you will have these tips handy later to remind you. In the spring time in Big Near Lake California it freezes at night . Will this hurt my Bleeding Heart Plant? Do I need to bring it in at night?? You should be fine. The plant is hardy in zones 3-9. If it is actively growing during a freeze, you might need to cover it, but the crown will take a freeze.